The Thunder beat the Blazers and threaten some Nuggets they could with the Heat. Westbrook beats a historic record of Wilt Chamberlain. 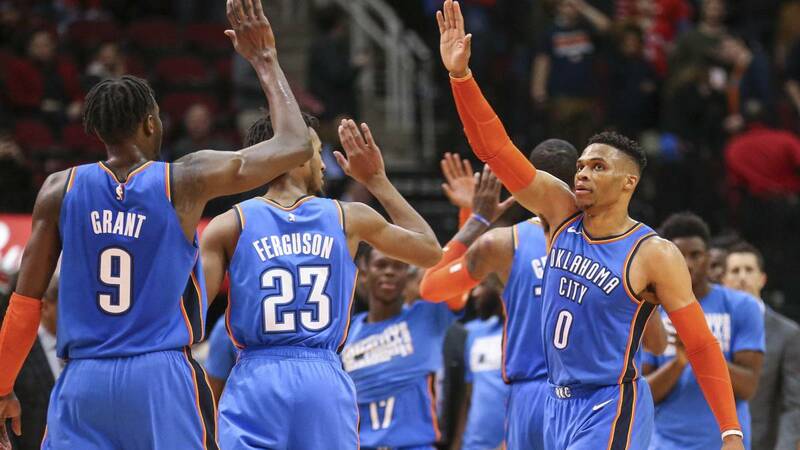 A at full speed and with that basketball of physical imposition and electric trances that can make them fearsome in the playoffs, Thunder are positioning themselves as, perhaps, the great danger for the Warriors in the West. At least, they have stopped looking back and are now only one game away from the Nuggets after crushing the Portland Trail Blazers, who in turn seem more concerned about trying to save fourth place against the assault of James Harden and his Rockets. The Thunder won 120-111 to the Blazers and the Nuggets, after three straight losses, they beat 103-87 to a sad Heat. Now, behind the Warriors, 38-18 for Denver, 37-19 for the Thunder and 33-23 for the Blazers. The fight that will come after the break of the All Star is defined. Warriors on the sidelines, it does not seem that there is a more fit team in the West than the Thunder, who have won 11 of their last 12 games. In that stretch, The Blazers (now three losses in four) have lost five times. And from there a current gap evident in a direct duel in which the Oregon fought in the third quarter to turn a 68-49 in a 87-82 but they ran out of strength after a rival who never stops pushing. And it works like a clock (one that goes full steam) when (and it has been doing it for weeks) Russell Westbrook assumes a subordinate position with respect to Paul George in attack. The chemistry between the two has never been better, and this match was evidenced with double triple-double: 47 + 12 + 10 for the forward (8/13 in triples), at the MVP level, 21 + 14 + 11 for the base , who entered the last quarter with only five assists but was in charge of feeding George in the last minutes. For the latter he is the third triple-double of his career. Westbrook has 127, 23 just this season. And now diez followed, something that nobody had ever achieved (Wilt Chamberlain linked 9 in the 1967-68 season) . Paul George did not sign one since March 2014. At that time, between his second and third, Westbrook has amassed 119. The things of these Thunder, in which Westbrook averages 21.2 points, 11.1 rebounds and 11.2 assists and George 28.3 points, 8 rebounds, 4 assists and 2.3 steals. Overwhelming, more if Deonte Burton appears to score 18 points and finish a conclusive victory before a Blazers slightly downwards: 31 points of Lillard but 7/27 in shots between McCollum (13 points) and Nurkic (9) . The fight of The Thunder is, right now with some Nuggets that have gone from leading the West to seeing how, without remission, they move from OKC the second place chair. At least, they took advantage of the visit of some Heat of balance to stop a run of three defeats in a row: 103-87 final with 23 points and 12 rebounds from Jokic and 40 points between Beasley and Craig. Enough against a rival in which no one passed 15 points (Winslow) and who has conceded four straight losses in a very tough tour in the West and falls to 25-30, ninth of the East, when not so much was 24-24. Bad times in South Florida and good in the Rockies, although, without any pretense, a huge danger emerges from OKC. And it advances at a hellish pace.